It's Friday. It's time for a fun green book giveaway. 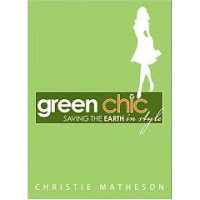 The book, Green Chic: Saving the Earth in Style, by Christie Matheson was just published in March 2008 and was featured in Glamour Magazine's April issue. Green Chic is a perfect resource for women who want to start making a difference in their environment, but think that it may ruin their chic lifestyle. In fact, this book shows that going green is inherently stylish. Written from the perspective of someone who does not recycle, who doesn't wear hemp clothing and who loves to take long showers, it's informative and entertaining style will relate to anyone who wants to live more environmentally friendly. Unlike other books on the subject, it's not about buying your way to being green—or just appearing green—it's about shifting your mindset, changing your attitude, and developing a personal style that is green. And being truly green is, surprisingly, inherently chic. With Green Chic, consumers can discover exciting, efficient, and effective ways to be environmentally conscious, and take the stylish path toward saving the planet. Based on that description, I fully expected the book to focus on fashion and home decor. In fact, I was rather excited to read a different take on environmentalism, kind of an Organic Style meets Natural Home and Garden, but more fashion and more green. Unfortunately, I didn't find it to be any more chic or stylish than the seemingly dozens of other green books that have been published in the last year. It's mostly about how to incorporate green living into your daily life, not unlike The Green Book. However, if you are just starting out greening up your life, it makes for a decent reference guide or if you have someone you gently want to convert, it is a suitable read. My one gripe with the book is her treatment of reusable menstrual products. If you are interested in entering the book giveaway, add your name to the comments for a chance to win this book. The contest ends today, Friday, May 2nd, at 6:00 pm PST. I'll announce the winner on Saturday. Time's up! I'd like to read this book! Sounds good...throw my name in please! Having something to share w/ my very not green friends, sounds good, I think they all just think I'm a freak LOL. Count me in! I do hope I win one of these books, they all sound so interesting. Still hoping and praying all is well with your husband. Okay. I've never been chic in my life, but green chic sounds worth a try. Please add me to the draw, thanks! here i am, very excited about this one! This book looks fun! Add my name! well, it's too bad that fashion and chic-ness arenn't a key topic, I know I could use the eco-fashion advice! (Do ratty old cargo pants and a scrubby t-shirt count as fashion?!?) Anyways, count me in for the drawing. I am stating to sound like a broken record, but this book has been on my library hold list for eons too! Toss my name in the hat Crunch. I've never even heard of this book! Oh, I write a blog for 20 somethings on all things green. I'd LOVE to do a book review of this on my blog!! So, yes, COUNT ME IN. I'm in! I'm new around these parts and just wanted to say... you are an inspiration! Sure, count me in. - Erin E.
Please enter my name into the drawing! I have other friends who will book-pool this read!!! I'm a greening newbie. Sounds like I could learn a thing or two from this book. I'm in! Thanks for all of these. Count me in!! I want to be tres chic and tres green! i'd like to be added, mam. I am in, this one sounds fun! I want to win!!Please! Please! Add me in! Hope all is going well! I'd love to read it.